Originally published under the title, "Global Jihad? Never Heard of It. Berkeley's Bazian Still Hyping 'Islamophobia'." Hatem Bazian thinks we're all getting too worked up about the Paris attacks. 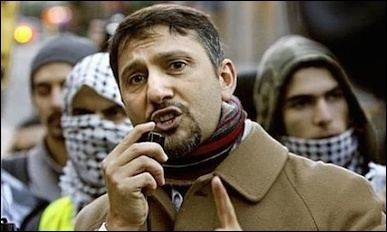 With global jihad in its ascendancy, UC Berkeley's Hatem Bazian delivered a lecture at a private event in Dearborn, Michigan last Friday, titled "Islamaphobia: Muslim in the Public Square." Given the multiple ISIS attacks on Paris only a week earlier and the fact that French and Belgian authorities continue to hunt down the accomplices, the timing was tone-deaf, to say the least. As director of UC Berkeley's Islamophobia Research & Documentation Project, Bazian displayed the usual fear-mongering, complete with divisive, politicized rhetoric. He blamed the alleged rise of "Islamophobia" in America–a claim that FBI hate crime statistics for 2014 continue to contradict–on "a massive demographic change . . . that has made individuals still living in the 1950s uncomfortable" and to "shrinking middle class" induced "resentment." Perhaps what's fueling resentment, if indeed it exists, are Middle East studies academics like Bazian who insist on assigning victimhood to Muslim-Americans and villainy to the West, while accusing anyone who encourages introspection and reform within Islam of being a bigot.